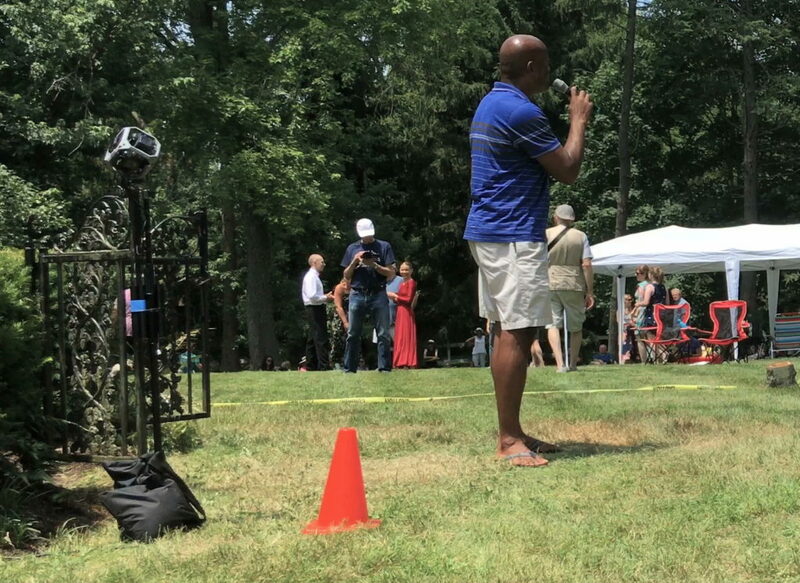 My latest 360 video, experimenting with a public sing-a-long event at what was the home of the great lyricist Oscar Hammerstein II in my town of Doylestown, PA. Recorded with my new 6 camera GoPro Hero5 Session rig in a 3D Printed cage. This cage design I found on Thingiverse. It was designed for the "full size" GoPro cameras, but it also works perfectly with the Sessions, without modifications. This open cage style allows me access to the miniUSB3 ports for connecting charging cables to run off of external batteries. I should be able to run the cameras all day with this set-up! (Internal batteries last about an hour). 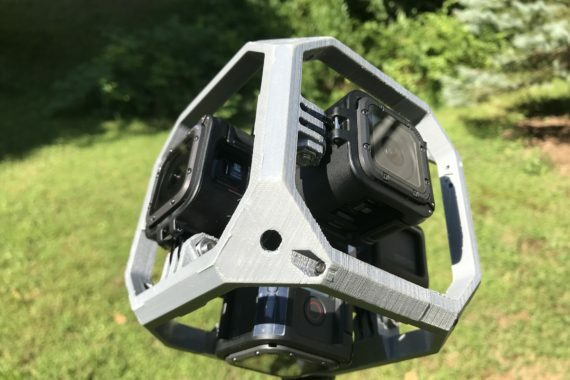 6 GoPro HERO5 Sessions in a 3D Printed cage. The 6 cameras can be controlled with a Wireless Remote, but I've been finding pretty inconsistent connecting to all 6 of the cameras. I cannot trust that all 6 will start/stop recording. With this setup, I'm finding it best to just keep it recording unless I can walk up to it to start/stop manually. 64GB microSD cards gets you about 2 1/2 hours at the 2.7K resolution used for 360 capture. The camera rig setup on the rear of the "stage." I would come to find out that my placement of the camera was probably not the best. I thought all performers would be on the porch of the house, but many stood on the lawn in between the crowd. This put their backs to my camera on many performance numbers. But this was more of an experiment, and it was only intended for me to "get what I could." So I used the performances that worked the best. I'm finding it difficult with using 360 at public events. The nature of their viewpoint means that they work best placed in the middle of the action. This is not always the easiest to do, since it is distracting for the performers, audience, not to mention others documenting the event who see my camera rig in all of their own photos/videos. Logistics that still need to be worked out. 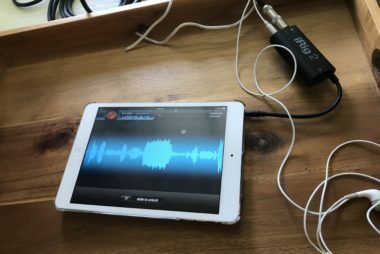 I used an iPad connected to the sound mixer to record the full audio of the event. Once back at my iMac, I stitched all 6 camera videos using Autopano Video & Giga. Combined resolution of the GoPros is 8K. Awesome for video quality, but my poor 2013 iMac! Even with decent graphics memory---I learned not to multitask too much while rendering. This video was great for me to get to understand some of the more advanced functions of Autopano, like using masking to reduce the parallax effect between stitch lines. Once done with stitching, time to edit in Final Cut Pro X. Just started using their latest 10.4.3 update, and I like the improvement to adding titles. You will see in the videos below. Patching the nadir (bottom view) is great to cover up the tripod, but it really adds to render time. A LOT. 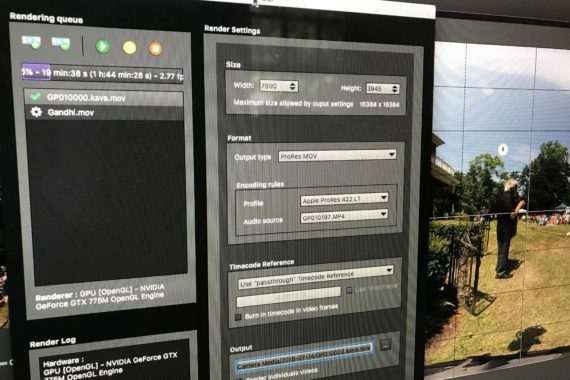 Taking my 5:30 minute 8K video, and rendering to 4K with "Better Quality" encoding selected--8-10 hours! Yikes! "Faster Encode" is much more reasonable, and seems to look fine. Now for the videos. The first one is very special. I was so happy to capture this moment well in 360. This was a benefit event in my town to raise awareness and funds to convert what was the home of Oscar Hammerstein II into a museum. Some of the most famous lyrics of broadway were written here. Amongst the guests was Arun Gandhi, the grandson of Mahatma Gandhi. Below is the video of his main talk to the crowd. BTW, I discovered what I think is a fantastic platform for 36 video/VR content. Veer TV seems to work great on every platform I could try. It is what is embedding my videos here. And it is JUST 360/VR content. In the first month I have started putting content on it, I have been very impressed with the traffic views my works are getting--far exceeds the traffic from other traditional video platforms. As I expand my own capabilities and client base, I plan on using Veer as my main distribution platform. The second video from this event: guest speakers reading quotes from Oscar Hammerstein, followed by leading the crowd to sing to the theme from Oklahoma!